Welcome New & Returning Visitors! If you have never been to location before or only once in the passed, we understand if you need help finding us! Although we have many signs up pointing to the road which brings you to our location, Google Maps' depication of our location can throw visitors off and make them confused. For this reason, we created the custom image on this page to help everybody and eliminate any complications. 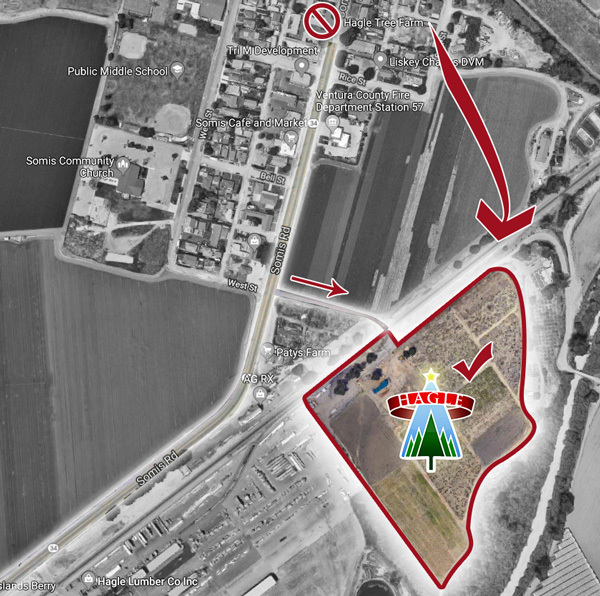 Although our address is listed as Somis Rd., we are located on a cross street which is a continuation of West St. from the other side of Somis Rd. (see map for visual). Please be sure to look both ways when crossing the train tracks! Please give our staff a call if you experience any complications, we'd be happy to assist you! We look forward to seeing you and hope you have a Merry Christmas! If you need step by step directions to our location, feel free to use the Google Maps widget below for the fastest, safest route!